I woke up a few days ago with that achy feeling in the back of my throat. You know the one. Actually, I didn’t. In their eagerness to share with me, the children have given me a wicked sinus cold which has since migrated into my lungs. I’m on puffers, but also trying to decide at what point I should seek medical attention for the sensation of a brick sitting on top of my lungs. But that’s neither here nor there. The real point of this blog post (aside from ensuring that I post at least once a week) is that I’ve made an important decision: from now on, we need to keep an inflatable mattress and appropriate bedding in the van at all times. No, seriously. If I have to drive around with the equivalent of an entire living room on wheels, I might as well have a cozy place to nap while I’m waiting for my children’s extracurricular programs to end. I’m expending way too much energy just trying to remain upright as I watch my daughter bounce around on a trampoline. I wish I could just lie down right here, but vinyl tile and fluorescent lights don’t make for a healing environment. No, seriously. 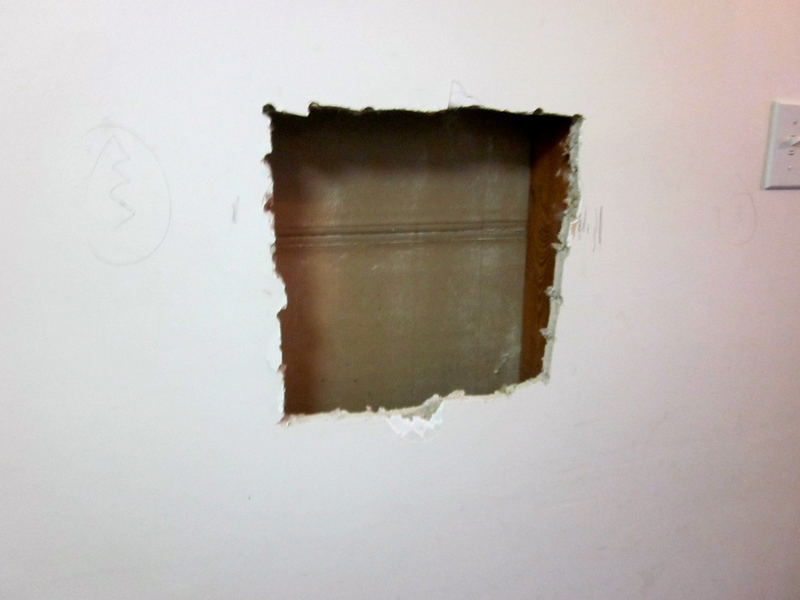 It’s a hole… in the wall. Or it was. See? 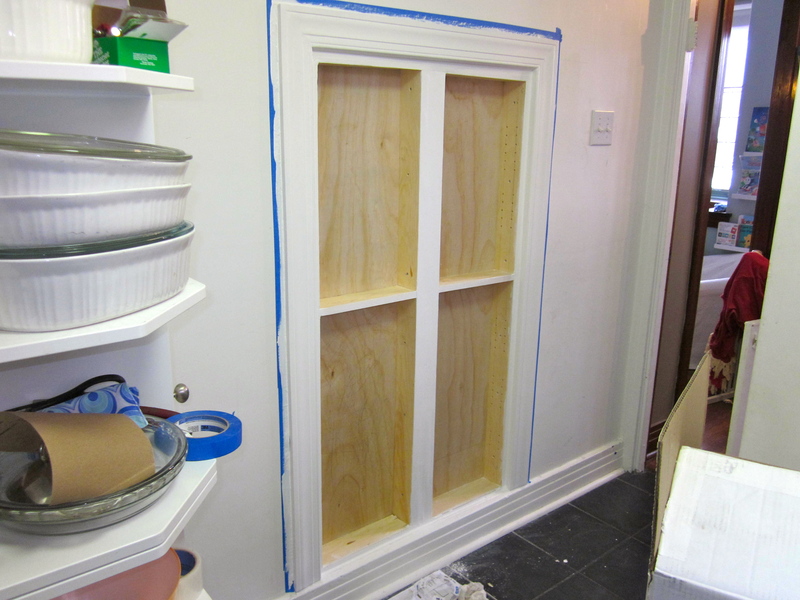 In my eternal quest for more space in our little house, I started thinking about all the wasted space between the walls. 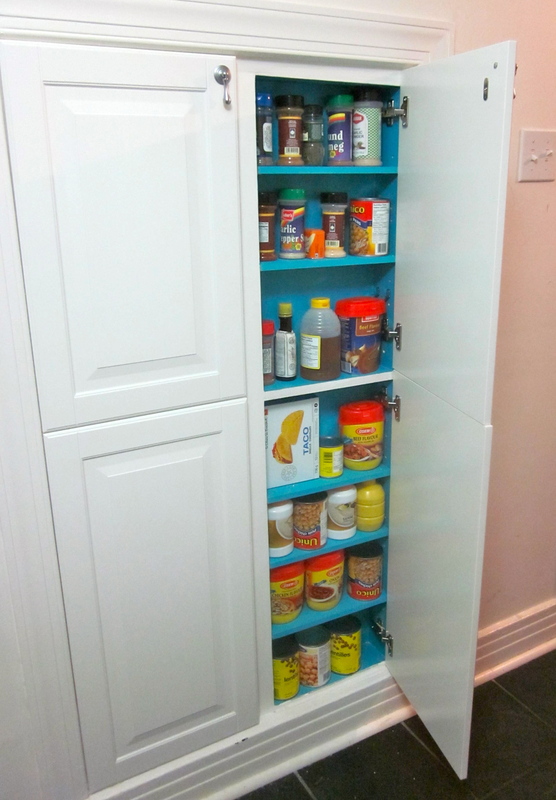 The more I thought about it, the more I pined for a shallow pantry in which to store our canned goods. My longing turned into a burning desire, which turned into the above hole. 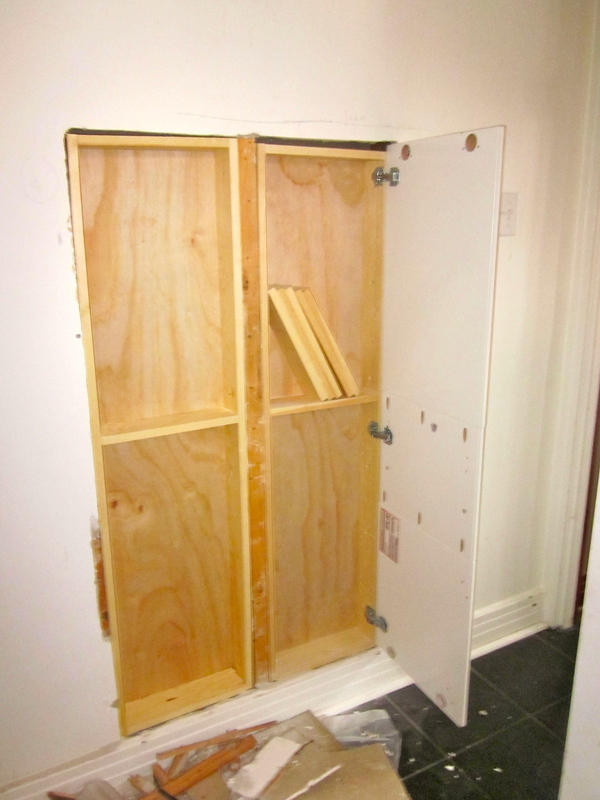 Seeing that empty cavity inside the wall made me sigh with contentment. Then I got to work. As you can tell in this photograph, they’re not level. That’s okay, though – neither is anything else in my house. Suddenly it looks like something you might actually want in your kitchen, right? And then filled it up. 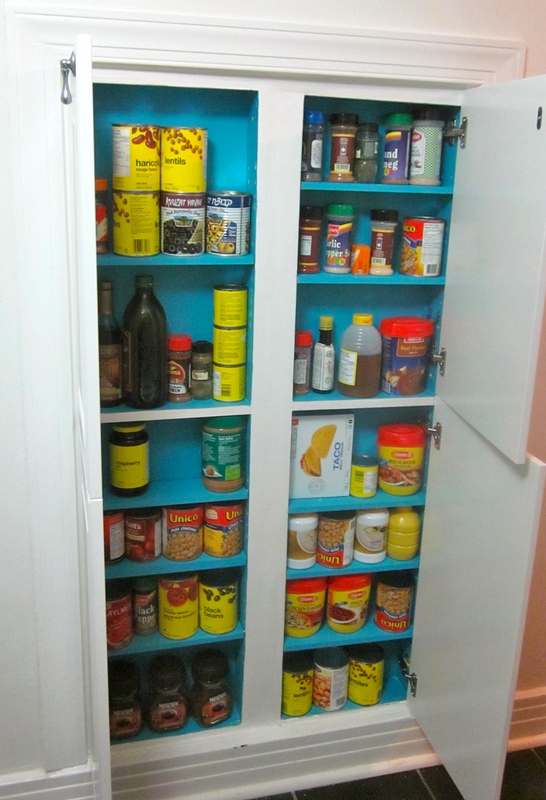 Oh, and we painted the inside my favourite colour… so now I smile every time we open our pantry. And you would not BELIEVE how much stuff it holds! The shelves are only deep enough to hold one can, which means we can always see everything in there. 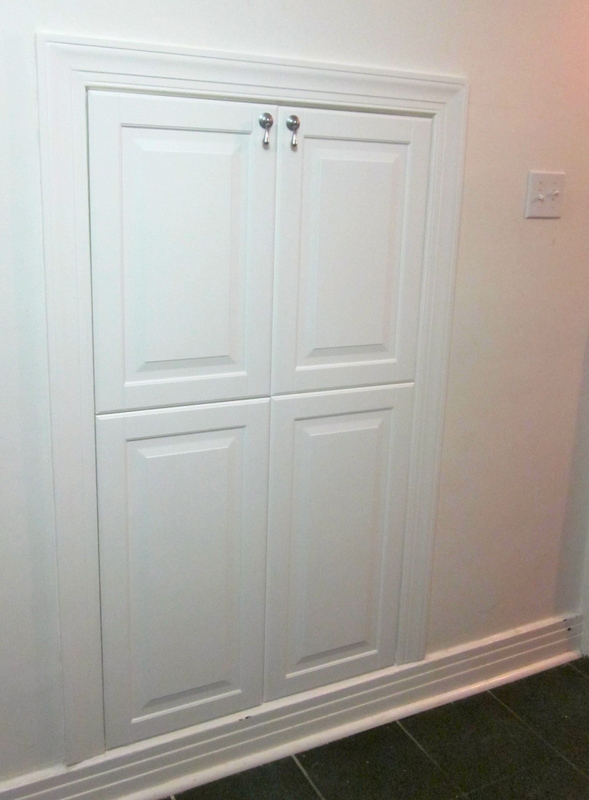 This pantry has freed up three whole drawers in my IKEA pull-out pantry, which now proudly house the small appliances that were cluttering my countertop. I love this thing. It’s the best hole in the wall ever. 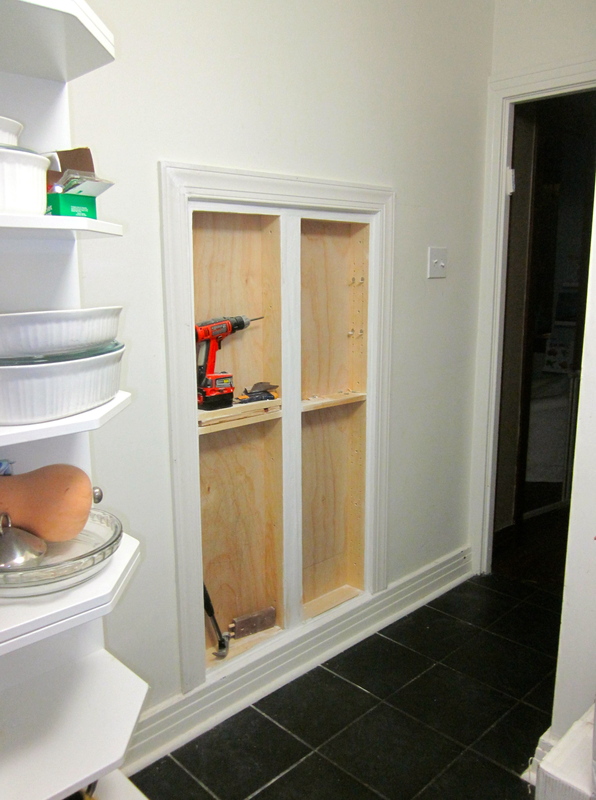 If you could have a cupboard like this anywhere in your home, where would you put it? And what would you fill it with? Hi again. Remember me? Yeah, so do I. I think. It’s been a while. What did I last blog? Mastitis? Sinus infection? That was so four weeks ago. A lot has happened since then. So I got over the sinus infection and had to start preparing for Passover. In my universe, that means spending a week freaking out about Passover cleaning, followed by one day of actual cleaning, followed by bringing all the Passover dishes and utensils upstairs and finding them homes in our kitchen. And then, the deluge Passover break. Our lovely nanny had the entire holiday off, which meant that it was just me and three children for a week and a half. Not so bad, you may say, and you’d be right, except for the fact that it was Passover. I don’t use my dishwasher on Passover, which means lots more time spent doing dishes and cleaning up. We can’t eat out on Passover, which meant no ordering in and no convenience foods if I was feeling overwhelmed. And the weather was icky, so I couldn’t kick them out into the backyard. As much as I adore my children, there’s such a thing as too much family time. And then… some kind of stomach bug knocked me flat. It’s a good thing that Mr. December knows how to rise to a challenge, because I was weak as a kitten and completely unable to get myself a drink, let alone stand up long enough to diaper a child. I’m still feeling the aftereffects – a bit like a hangover – and can only hope that more fluids and some solid nutrition will have me feeling good again soon. And as we all know, feeling good leads to blogging… right? Well, a girl can hope.